While infections from Mycobacterium tuberculosis are relatively rare in the U.S., the microbe is still a leading cause of death worldwide. Moreover, the odds of encountering the microbe in the U.S. are so low, in fact, that risk factors for the disease can easily go unnoticed—if you happened to carry a gene that predisposed you to tuberculosis, you likely wouldn’t know. However now, new findings from investigators at Rockefeller University reveals that such genetic variants do indeed exist—and they are surprisingly common. Interestingly, the researchers also uncovered genetic mutations that rob the immune system of its ability to combat more ubiquitous germs of the same bacterial family, mycobacteria. The findings—published recently in two articles in Science Immunology, one entitled “Human IFN-γ immunity to mycobacteria is governed by both IL-12 and IL-23,” and the other “Tuberculosis and impaired IL-23–dependent IFN-γ immunity in humans homozygous for a common TYK2 missense variant”—elucidate molecular abnormalities that make people vulnerable to mycobacterial infections. This research also points to strategies for treating or preventing some cases of tuberculosis (TB). About one in five people worldwide are infected with TB. Of those, only 10%, at most, will show symptoms—because most immune systems have tools to fight the microbe. When these tools are absent or dysfunctional, however, the infection can damage the lungs and other organs, and even cause death. Hoping to better understand why only some people are prone to TB, the researchers worked with clinicians across the world to collect DNA samples from patients with active forms of the disease. 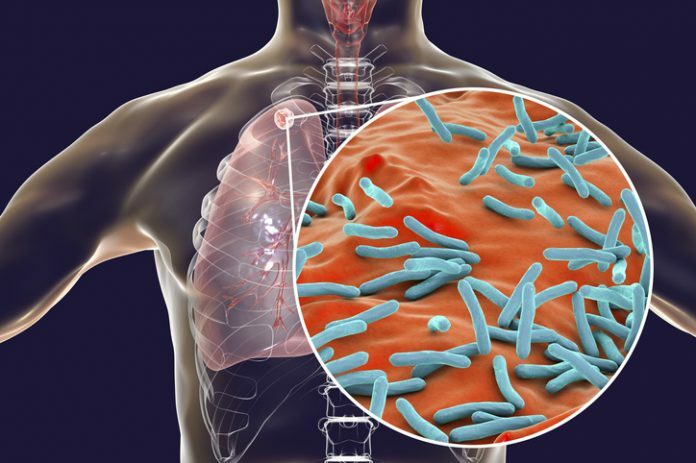 By analyzing these samples, the researchers discovered that the risk of developing TB is heightened in people who have two copies of a variation to the gene coding for the enzyme TYK2. Moreover, the researchers found, this genetic condition is widespread. “In Europeans, one in 600 people have two copies of this TYK2 variation. And in the rest of the population the rate is between one in 1,000 to one in 10,000—which is still not rare,” explained senior investigator in both studies Jean-Laurent Casanova, MD, PhD, professor at Rockefeller University. “Putting these numbers in perspective, here at Rockefeller, there are probably around four to six people who have this genetic predisposition to TB.” Yet, that is not to say that those people will actually develop the disease—and, in fact, they probably won’t. “In New York, someone can have this mutation and their risk of getting TB is effectively zero. But if that person goes to work in a TB hospital in Africa, then the likelihood of getting TB is high—one hundredfold higher than it would be for a person without the genetic variant,” added Casanova. Historically, a person with a TKY2 mutation would be unaware of her susceptibility until it was too late. However, now that researchers have identified this risk factor, individuals traveling to regions where TB is common can obtain genetic tests to find out whether they are vulnerable to the disease. M. tuberculosis belongs to a broader class of microbes known as mycobacteria. Most of these bacteria are ubiquitous, but harmless. In a small fraction of the population, however, these common microbes can lead to serious infections—a condition known as Mendelian susceptibility to mycobacterial disease, or MSMD. In the current studies, the Rockefeller scientists identified two novel genetic causes of this condition, one that leads to a deficiency of the receptor for the immune cell protein IL-23, and one that leads to a deficiency of the receptor for a similar protein, IL-12. Both IL-12 and IL-23 promote production of gamma interferon, a molecule that contributes to immunity against mycobacterial infections. When cells fail to produce this interferon at normal levels, they become susceptible to widespread, poorly virulent mycobacteria. In other words, they develop MSMD. The risk for this condition is highest, the researchers found, among individuals with a mutation that affects both IL-12 and IL-23 receptors. In addition to elucidating a new genetic cause of MSMD, this research helped the scientists understand why a TYK2 mutation might make people prone to TB. They found that when the enzyme’s function is disturbed, cells don’t respond normally to IL-23, and therefore produce less gamma interferon. And though low interferon levels may suffice to stave off poorly-virulent bacteria, they do not protect against stronger microbes like M. tuberculosis.